For other uses, see Restless Heart (disambiguation). Larry Stewart, seen here in 2003, has been the lead singer of Restless Heart for the majority of the band's career. Nashville record producer Tim DuBois created the band in 1984 to record demos of songs that he had written. The founding members were John Dittrich (drums, vocals) (born April 7, 1951), Paul Gregg (bass guitar, vocals) (born December 3, 1954), Dave Innis (piano, keyboards, guitar, vocals) (born April 9, 1959), Greg Jennings (lead guitar, mandolin, vocals) (born October 2, 1954), and Verlon Thompson (lead vocals). Thompson left before the band had officially been named or released a single, because he did not feel comfortable with the country pop style that DuBois wanted the band to pursue. Replacing him on lead vocals was Larry Stewart (born March 2, 1959), who was also working as a demo vocalist at the time, and was a college friend of Innis's. After leaving the group, Thompson recorded both by himself and in collaboration with Guy Clark, in addition to writing several country hit singles in the 1990s. One of the demos that the band recorded was for "Love in the First Degree", later a hit for Alabama. Due to the success of the demos, the members chose to become an official band, and they were signed to RCA Records Nashville in 1984. After assuming the name Restless Heart, the band released its self-titled debut album on RCA in 1984. When this album was originally released it included 10 songs, but was later reduced to only eight songs (excluding Few and Far Between and Love To Spare), of which four were singles: "Let the Heartache Ride", "I Want Everyone to Cry", "(Back to the) Heartbreak Kid" (previously recorded by Kathy Mattea on her self-titled debut album), and "Til I Loved You." Of these, the latter three were all top 10 hits on the Hot Country Songs charts. DuBois co-wrote "Let the Heartache Ride" and "Heartbreak Kid" with Van Stephenson, who would later become one-third of the country pop trio Blackhawk in the 1990s. After the success of "I Want Everyone to Cry", DuBois and RCA promoted the band through radio showcases and music video rotation, including the video for "Heartbreak Kid", which aired on VH-1. DuBois felt that touring was not a financial necessity for the band at the time, due to all five members also being session musicians, and having songwriting contracts with Warner Music Group at the time. While under such a contract, Innis co-wrote "Dare Me", a hit single for The Pointer Sisters. Two years later came Wheels, their breakthrough album, which produced four consecutive No. 1 hits on the country music charts: "That Rock Won't Roll", "I'll Still Be Loving You", "Why Does It Have to Be (Wrong or Right)", and the title track, written by Dave Loggins. "I'll Still Be Loving You" and "Why Does It Have to Be (Wrong or Right)" were both hits on the Adult Contemporary charts, as was "New York (Hold Her Tight)", which was released only to that format. Furthermore, "I'll Still Be Loving You" entered the top 40 on the Billboard Hot 100. The album was certified gold by the Recording Industry Association of America (RIAA) for shipments of 500,000 copies. Another track from the album, "Hummingbird", was later recorded by Ricky Skaggs on his 1989 album Kentucky Thunder, and was a top 20 country hit for him in 1990. Tom Roland of Allmusic wrote that "[t]he guys found their niche with this project. Big, overpowering sound, heavy backbeats, and very tight harmonies are here." The band's third album, Big Dreams in a Small Town, came in 1988. From it came two more number ones: "The Bluest Eyes in Texas" and "A Tender Lie", as well as top-five hits in its title track and "Say What's in Your Heart". The latter of these was also a number one on the RPM country charts in Canada. This album was also the first to feature members other than Stewart on lead vocals: Gregg sang "El Dorado" and shared lead vocals with Stewart on "Carved in Stone", while Dittrich sang "Calm Before the Storm". The band members wrote some of the songs themselves, while others were co-written by outside writers, including "A Tender Lie", written by Randy Sharp. People gave the album a positive review, noting the band's musicianship and prominent vocal harmony, as well as the "considerable amount of passion" in their music relative to their contemporaries. Restless Heart's fourth album, Fast Movin' Train, was released in 1990. Its title track (also written by Loggins) and "Dancy's Dream" were top-five hits, while "When Somebody Loves You" and "Long Lost Friend" were less successful. Robert K. Oermann of The Tennesseean found this album superior to the ones before it, praising the "direct approach" of the singles' lyrics, while also noting a roots rock influence in the increased use of acoustic instruments over the preceding albums. Stewart also sang backing vocals on "They Just Don't Make 'em Like You Anymore", a track from Kenny Rogers' 1991 album Back Home Again. A greatest hits package, The Best of Restless Heart, followed in 1991. It included two new recordings, both of which were released as singles: "You Can Depend on Me" at No. 3 and "Familiar Pain" at number 40. Larry Stewart left the band in 1992 to pursue a solo career, also on RCA. His solo debut single "Alright Already" reached No. 5 on the country music charts in 1993. He recorded one album for RCA and two for Columbia Records between then and 1997, and while these albums accounted for seven more charted singles, none were as successful. Dittrich, Gregg, and Innis alternated as lead vocalists on the band's fifth studio release, 1992's Big Iron Horses. This album produced the band's biggest crossover hit in "When She Cries", which went to number 9 on the country charts, number 11 on the Billboard Hot 100 (their highest entry on that chart), and number two on the Adult Contemporary charts. After it came "We Got the Love" (guest musician on banjo was original Eagles member Bernie Leadon) and "Mending Fences", which both fell short of the country top 10 and its title track, "Big Iron Horses", was far less successful, peaking at number 72. Keyboardist Dave Innis also left the band in 1993, reducing the band to a trio. That same year, the band reached the top of the Adult Contemporary charts as guest vocalists on jazz saxophonist Warren Hill's debut single "Tell Me What You Dream." The next album, 1994's Matters of the Heart, included only Gregg, Jennings and Dittrich, with studio musicians rounding out the roster. Its only single, "Baby Needs New Shoes", fell short of the top 40, and the remaining three members disbanded at the end of 1994. 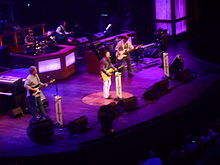 Jennings joined Vince Gill's band, while Dittrich founded a band called The Buffalo Club in 1997 with Charlie Kelly and lead singer Ron Hemby, formerly of The Imperials. The Buffalo Club recorded one album for Rising Tide Records and charted three singles, including the top-10 country hit "If She Don't Love You" (a song which had previously been turned down by Restless Heart), before the band split at the end of the year. The original Restless Heart members, except Innis, reunited to record three new tracks for their second greatest-hits compilation in 1998, Greatest Hits. This album produced their first top-40 country hit in five years, "No End to This Road". After a year-long tour with Vince Gill and another year of dates on their own, Restless Heart went on hiatus once more. In 2002, Gregg placed a phone call to Innis, with whom he had not had any contact in 10 years. That led to Restless Heart reuniting once again and returning the band to its complete classic lineup. They soon began touring and released a single called "Torch of Freedom" which did not chart. In 2004, the band signed to Koch Records, then went into a Muscle Shoals, Alabama, recording studio to record the first full-length album to feature the original lineup since 1990's Fast Movin' Train. The new album, entitled Still Restless, was co-produced by Mac McAnally and Kyle Lehning, with three of its songs having previously been recorded by McAnally himself. Its lead-off single, "Feel My Way to You", peaked at number 29 on the country music charts. However, Koch closed its Nashville division in early 2005, and the album did not produce any other singles. The band released a live album, 25 and Live, in 2007 through their website. To commemorate the band's 30th anniversary, Restless Heart began its 30 Years & Still Restless Tour. The band also announced plans to release new music in 2013, but no further details have been revealed. In 2015, Restless Heart was inducted into the Oklahoma Music Hall of Fame. The band's Dave Innis, Paul Gregg, and Greg Jennings hail from the state. DuBois said that he conceived Restless Heart as "a hot, instrumental band that could really play well on stage—that had great harmony" and that he had given them songs that he felt were "natural" but had been rejected by other artists such as Alabama for being "too pop". He noted that during showcases for radio representatives early in the band's career, he was often questioned on the band's ability to "duplicate their records live" due to them having been assembeled in a studio setting, but felt that live performances were not an issue due to the band having played and sung everything on their debut album without any additional musicians or vocalists. Restless Heart's sound draws influences from mainstream country music, as well as from pop and rock. Their use of layered harmonies and multiple Adult Contemporary crossover hits have drawn comparisons to the Eagles. A 1985 article in Billboard wrote that debut single "Let the Heartache Ride" "introduced the band's razor-edged vocal harmonies and scorching instrumentals." ^ a b c d e f g h i j Huey, Steve. "Restless Heart biography". Allmusic. Retrieved 2008-01-07. ^ a b c d e f g h i j Whitburn, Joel (2012). Hot Country Songs 1944 to 2012. Record Research, Inc. p. 279. ISBN 978-0-89820-203-8. ^ a b Hoffard, Vince (January 13, 2016). "Grammy nominee Verlon Thompson plays The Old Feed Store". The Southern Illinoisan. Retrieved June 17, 2018. ^ Flint, Joseph H.; Nelson, Judy A. (August 24, 1993). The insider's country music handbook. Gibbs-Smith. p. 280. ^ "Kathy Mattea". Allmusic. Retrieved July 30, 2018. ^ a b c d "Restless Heart not restless for tour". Billboard: 45. November 23, 1985. ^ a b Brent Mann (2003). 99 Red Balloons And 100 Other All Time Great One-Hit Wonders. Citadel Press. p. 6. ISBN 9780806525167. ^ "Kentucky Thunder". Allmusic. Retrieved June 17, 2018. ^ Roland, Tom. "Wheels". Allmusic. Retrieved June 17, 2018. ^ "Picks and Pans Review: Big Dreams in a Small Town". People. November 7, 1988. Retrieved July 30, 2018. ^ Robert K. Oermann (April 15, 1990). "Prime cuts make tasty listening". The Tennesseean. p. 16. Retrieved April 20, 2019. ^ "Faces to watch" (PDF). Cash Box: 28. April 27, 1985. "I Want Everyone to Cry"
"(Back to the) Heartbreak Kid"
"Say What's in Your Heart"
"Tell Me What You Dream"
"Feel My Way to You"
This page was last edited on 21 April 2019, at 01:55 (UTC).